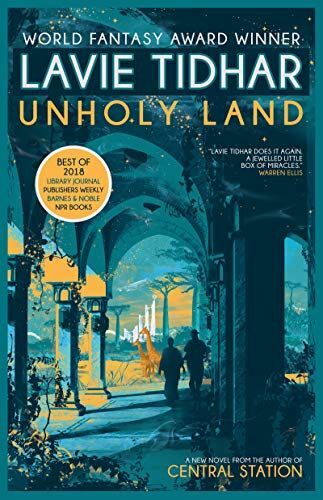 Unholy Land by Lavie Tidhar. Review. The order in which you read books can often influence how you feel about them. I picked up Lavie Tidhar’s latest novel after having finished Paul Auster’s surreal The New York Trilogy. 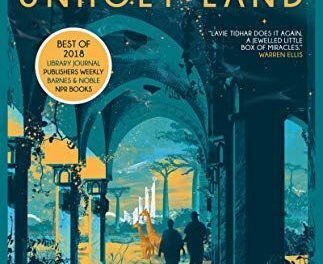 Tidhar’s Unholy Land read like a science fiction sequel, with its writer protagonist taking on cases like the detective characters in his novels and a jarring, surreal approach to structure and form. It’s a coincidence Auster would appreciate. Thankfully, Tidhar doesn’t continue with Auster’s casual misogyny. The novel follows pulp writer Lior Tirosh, who has gone home to see his dying father after many years away. Only his home is not in Israel, as he told his literary agent, but in an alternate world where Jews settled in Africa in the early 1900s. As a visitor from the outside, he is being kept close tabs on by those who protect the boundaries between worlds from eroding. But they aren’t the only ones with a stake in the matter. Narrative point of view is usually consistent within a novel – it might switch character focus or first-person narrators, but the kind of POV will remain unchanged. Tidhar laughs at such conventions, giving us multiple character POV’s across the full range of narrative style: first person, second person, and third person. The characters whose POV we are privy too aren’t even necessarily from the same world. This unusual narrative style takes some getting used to, though Tidhar uses the disorientation deliberately in the first sections of the novel. Tirosh’s story is told from the third person, with intrusive breaks of first-person narration from the main investigator, Bloom. When the reader finally feels like they might be getting to grips with the constant first-person/third-person shifts, Tidhar pulls the rug out from under us yet again with the introduction of Nur – along with being thrown in the deep again with the multiple-worlds set-up – and her second-person pov. While I appreciated we were never exposed to lengthy exposition dumps, the sheer lack of any exposition is not much better. Tidhar may well have had the worldbuilding in his head, but not enough of it ends up on the page, leaving it feeling underdeveloped. I was often reminded of Miéville’s The City and the City but there, the complex setting was adequately presented, so that readers had enough of an understanding without needing to understand absolutely everything. In Unholy Land, I understood nothing of the mechanics. Of course, this doesn’t always matter – there’s no rhyme nor reason to the time travelling in Octavia Butler’s Kindred, for instance, but I felt that with all the confusion of the narrative voice and plot, Unholy Land would have benefitted from a better grounding in its setting. As with most of Tidhar’s work, Unholy Land explores some deep and unsettling issues, forcing readers to look at the Israeli-Palestinian disputes from new angles. The thematic links throughout his novels remind me of Graham Greene’s Catholic novels. And like Greene, Tidhar isn’t afraid to ask the hard questions, looking at the darker side of his religion. 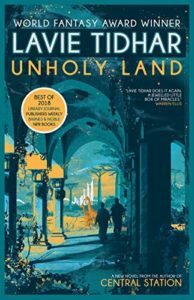 As complex and baffling as Unholy Land was at times, it still provides the reader with an interesting tale and take on war and religion… one that will have many reaching for non-fiction titles to explore more about Israel and Palestine. Verdict: An ambitious novel with many complex plot strands woven together with a jarring mix of narrative point of views. The narrative often gets lost amongst the technical acrobatics, but there’s still an intriguing tale at the heart of Unholy Land.